How is it that fertilized chicken eggs manage to resist fracture from the outside, while at the same time, are weak enough to break from the inside during chick hatching? It’s all in the eggshell’s nanostructure, according to a new study led by McGill University scientists. The findings, reported today in Science Advances, could have important implications for food safety in the agro-industry. 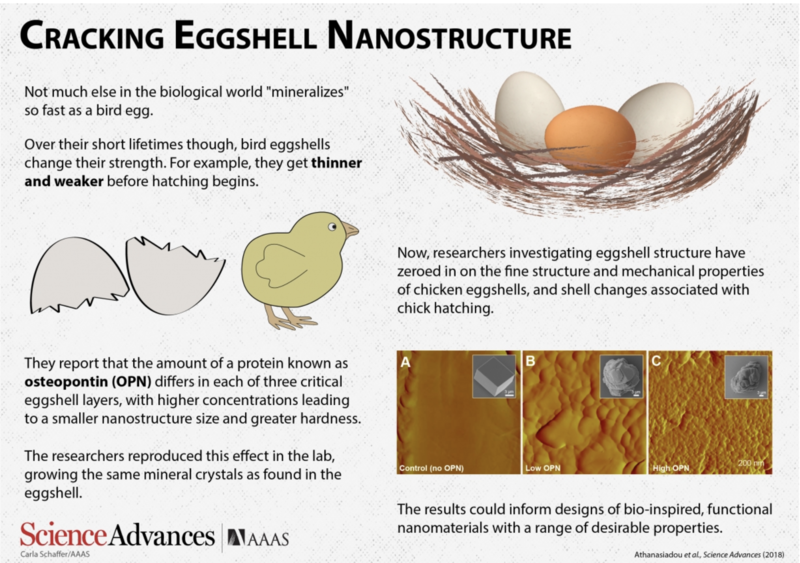 Birds have benefited from millions of years of evolution to make the perfect eggshell, a thin, protective biomineralized chamber for embryonic growth that contains all the nutrients required for the growth of a baby chick. The shell, being not too strong, but also not too weak (being “just right” Goldilocks might say), is resistant to fracture until it’s time for hatching. But what exactly gives bird eggshells these unique features? To find out, Marc McKee’s research team in McGill’s Faculty of Dentistry, together with Richard Chromik’s group in Engineering and other colleagues, used new sample-preparation techniques to expose the interior of the eggshells to study their molecular nanostructure and mechanical properties. 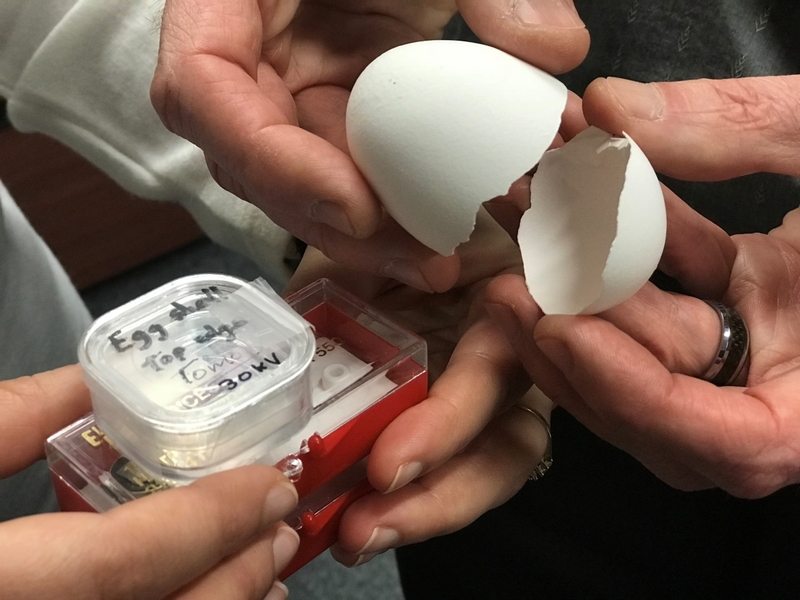 “Eggshells are notoriously difficult to study by traditional means, because they easily break when we try to make a thin slice for imaging by electron microscopy,” says McKee, who is also a professor in McGill’s Department of Anatomy and Cell Biology. Eggshells are made of both inorganic and organic matter, this being calcium-containing mineral and abundant proteins. Graduate student Dimitra Athanasiadou, the study’s first author, found that a factor determining shell strength is the presence of nanostructured mineral associated with osteopontin, an eggshell protein also found in composite biological materials such as bone. The results also provide insight into the biology and development of chicken embryos in fertilized and incubated eggs. Eggs are sufficiently hard when laid and during brooding to protect them from breaking. As the chick grows inside the eggshell, it needs calcium to form its bones. During egg incubation, the inner portion of the shell dissolves to provide this mineral ion supply, while at the same time weakening the shell enough to be broken by the hatching chick. Using atomic force microscopy, and electron and X-ray imaging methods, Professor McKee’s team of collaborators found that this dual-function relationship is possible thanks to minute changes in the shell’s nanostructure that occurs during egg incubation. In parallel experiments, the researchers were also able to re-create a nanostructure similar to that which they discovered in the shell by adding osteopontin to mineral crystals grown in the lab. Professor McKee believes that a better understanding of the role of proteins in the calcification events that drive eggshell hardening and strength through biomineralization could have important implications for food safety. This work was primarily supported by grants from the Natural Sciences and Engineering Research Council and the Canadian Institutes of Health Research.